Well, this was a disappointment. I was sent a sample for an independent review, and I trusted the size chart. Big mistake! I asked for my usual size Medium (UK 10) but Meaneor must have changed suppliers because this top is easily two sizes too small for me. The top part (shoulders) is only a little tight, but the sleeves are really narrow and there is no space at all for my hips. So when they say “slim fit”, that is code for “cut straight”. If your hips flare out, as mine do, this top was not made for us! To add to the size issue, the cuffs and bottom edge of the jacket are made of the same material, instead of the more traditional elasticated ribbed knit, so there is no stretch at all and I could hardly get my hand inside the cuff. It's a shame because the top is really pretty, and it deserves the 4 stars I've given it. I like the zip detail, the studs and the hood. The fabric seems of good quality and is a lot heavier and (I think) warmer than I anticipated. The colour (I have the Lake Blue) is also lovely. It's just that the cut will only suit a certain type of figure and is not forgiving or adjustable. And if anyone at Meaneor is listening, it would be an idea to include a hip measurement for this style of garment, just to give us a hint, because according to the size chart, this jacket should have fit me. To help you decide, I've just measured the inside of the hip hem for a size Medium (UK 10) and it's 34 inches or 86 cm. 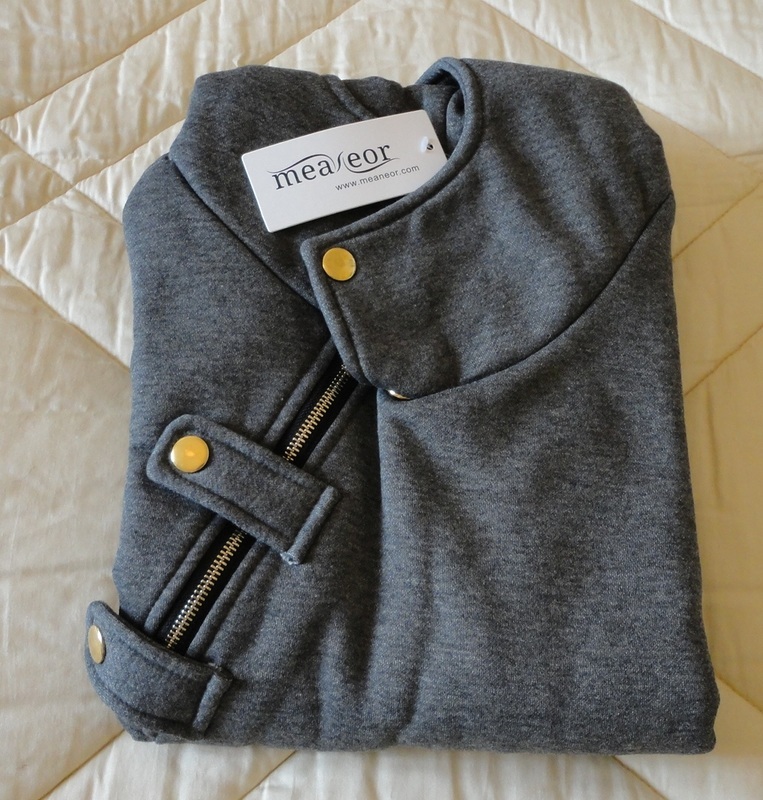 I was sent a sample of this jacket for review purposes, and I like it enough to give it four stars. The size guidance on this is a little more accurate than for other winter items from this brand, which run really small. My usual size is Medium (UK 10, US 8) and, so far, Meaneor clothes have been accurate but this jacket is smaller than expected. 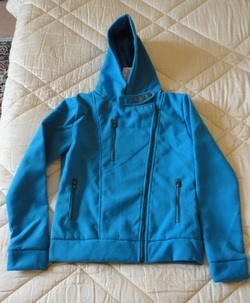 I can only wear it with a shirt underneath and since the material is very light, it's not a good winter option. 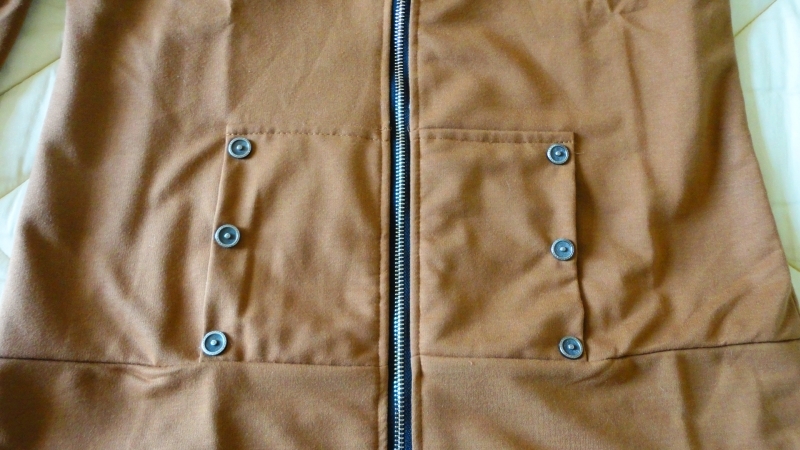 Probably suitable for an autumn or spring day, but not as a cold-weather outer jacket. 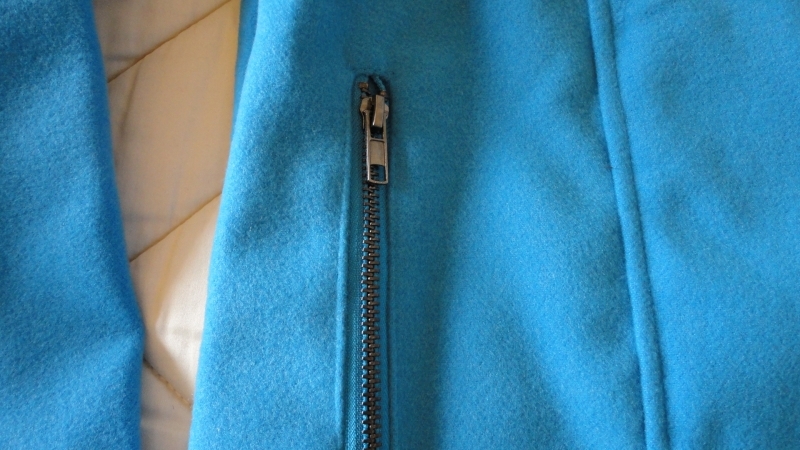 The lining is a silky polyester, somehow the photo made me think that it would be like fleece. I should have paid more attention to the detail photo, which shows it accurately. What I don't like is that the sleeves are cut very narrow and when I bend my arms, I can feel the pinch. I'm certainly not built up, but my arms have a little muscle that these sleeves were not designed to accommodate. I suppose the cut would look better if it were a size larger. The good part is that (tightness apart) the jacket is quite nice, very much like the photos and the colour is exactly what I expected. 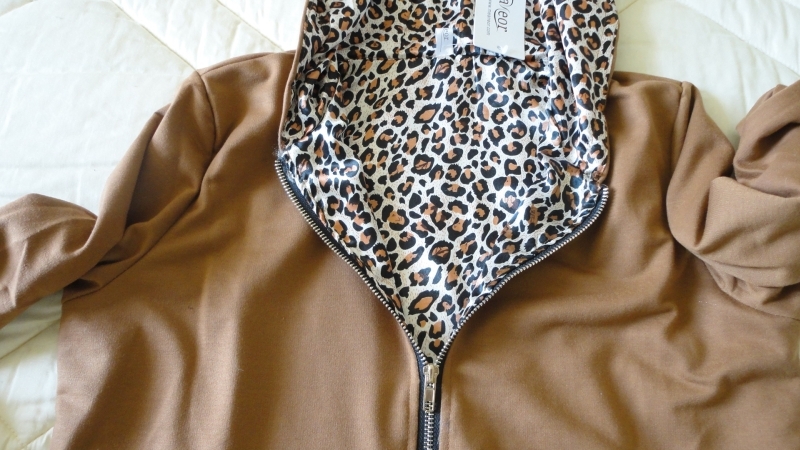 I asked for the Camel and it's a pretty, warm tobacco shade, really set off by the cute faux leopard-skin lining. It's long enough to to cover my hips and the top of my legs, and it has a moderately waisted shape. I like the stud details. The pockets are a bit shallow but I can just about tuck my hands in, if needed. The hood is large and well cut; it's actually usable, not just for decoration. So, I like this jacket, but would advise ordering a size larger than you think. 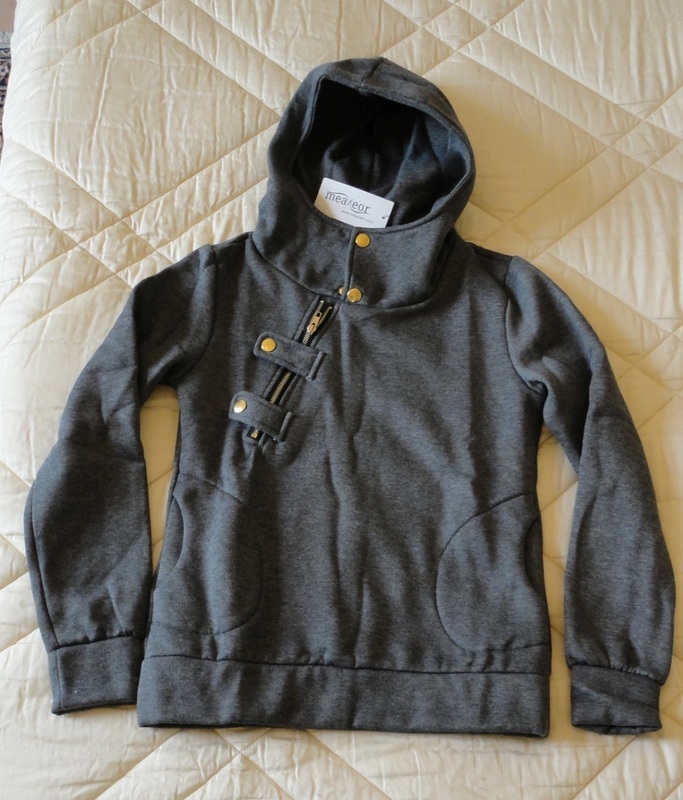 A sample of this hoodie was sent to me for an independent review, and I'm finding these winter items unexpectedly small. Normally I wear a size Medium (UK 10, US 8) and, so far, this brand has been true to size, but this hoodie is very different. Apart from being two sizes too small for me in both shoulders and sleeves, the cut is not suitable for someone whose hips flare out, as mine do. 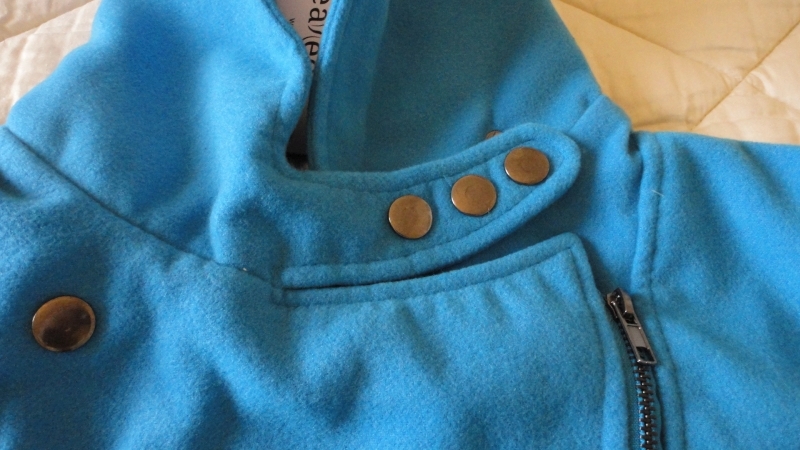 In addition, the cuffs and bottom edge of the jacket are cut from the same fabric, instead of the usual elasticated ribbed knit, so there is no stretch at all; my hand would not even fit inside the cuff! I have given feedback to Meaneor, suggesting that for this style of garment, it would be more useful to include a hip measurement. In the meantime, to help you choose, I've measured the inside of the bottom hem (where it should sit on the hips) of a size Medium (UK 10) jacket and it's 34 inches or 86 cm. So be guided by that rather than the incorrect bust size. And now for the positives. 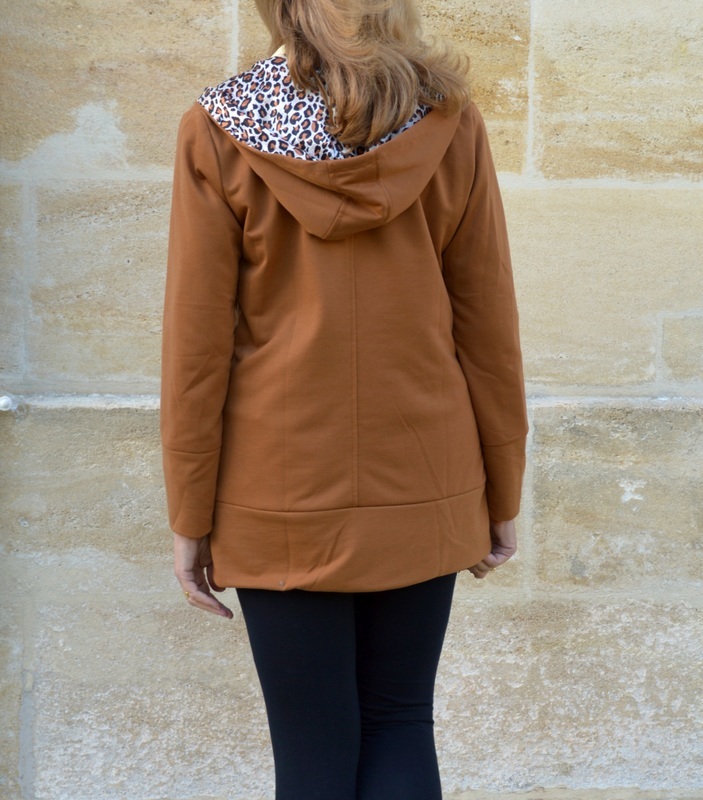 I really like the oblique zip, the studs and the hood. It's made of a heavier fleecy fabric than I expected, so it should be great for those colder winter days and the colour I picked (Dark Grey) is lovely and rich. Normally I'm not fond of grey but I find this one quite classy. 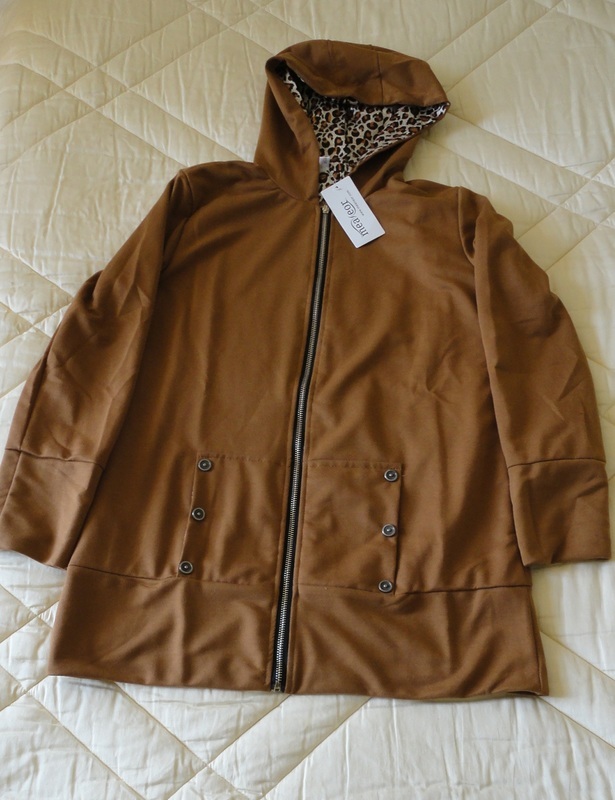 So, in summary, if you go for a much larger size than you would normally buy, this jacket should please you, but be aware that it is cut very straight and may not suit a certain type of figure. I've docked a star because of the very narrow cut, the rigid cuffs and the wildly inaccurate sizing.